IMAN has taken CommUNITY Café on a road trip of different Chicago neighborhoods, in a symbolic and substantive effort to share and connect stories from our city’s often disconnected neighborhoods. The last Café of 2012 was also the first in this series of four road shows, which will build momentum and excitement, across the City, leading up to Takin’ It to The Streets 2013 on June 15. 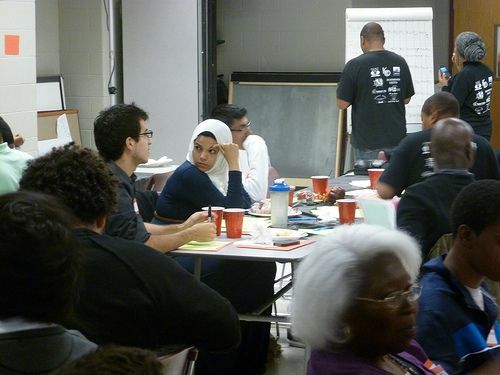 Such sharing and connection of stories between neighborhoods across the City mirrors the organizing work that IMAN does, in collaboration with partners from the United Congress of Community and Religious Organizations (UCCRO), to create long-term alliances that bridge cultural, racial, ethnic and religious divides. For example, October’s CommUNITY Café and September’s UCCRO Annual Convention were both held in the Little Village neighborhood. This Café, titled Ojalá! 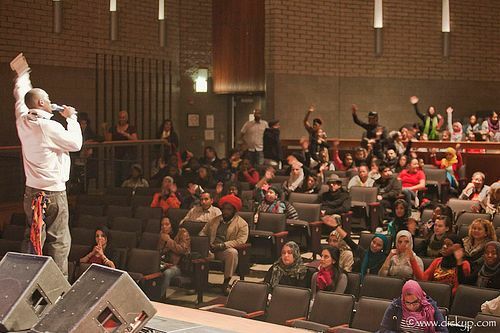 : Connecting Voices and Visions, was a powerful collaboration between IMAN and Enlace Chicago, a longtime ally and UCCRO partner. Its venue, Little Village Lawndale High School, and the struggle that the creation of this school required and represented, brought the evening’s theme and art together in an inspiring manner. It reminded the audience of one neighborhood’s rich history of the collective struggle towards a more empowering vision of our world. At the Café, beautiful and powerful musical performances by Liza Garza and Waterflow were punctuated by a multi-disciplinary performance by Cristal Truscott of Progress Theatre and Carlton Turner of MUGABEE. There was a special visual art exhibition, “Voices and Visions,” curated by Ali Hussein and Masooma Khan from The 9/11 Project, which featured original works of art by more than ten artists. You can view some photos from the evening here. The Café’s tour of Chicago and the buildup to Streets 2013 are part of an exciting plan that IMAN Arts & Culture is working on as part of IMAN 15th Anniversary celebrations. Stay tuned for the date and location of the first CommUNITY Café of 2013, as well updates on other events leading and building up to Streets. If you are excited about getting involved, the first public planning meeting for Takin’ It to the Streets 2013 is being held on Saturday, December 1 at the IMAN office on 2744 West 63rd Street, Chicago, IL 60629. The Health Clinic is one of the many inspiring and vital programs at IMAN. As a result of long-term planning and the confidence of the community it serves, the Clinic has recently seen tremendous growth in its hours, services, relationships and impact. This exponential growth started in 2010 when, with the generous support of Islamic Relief USA, we were able to hire the Clinic’s first Medical Director. 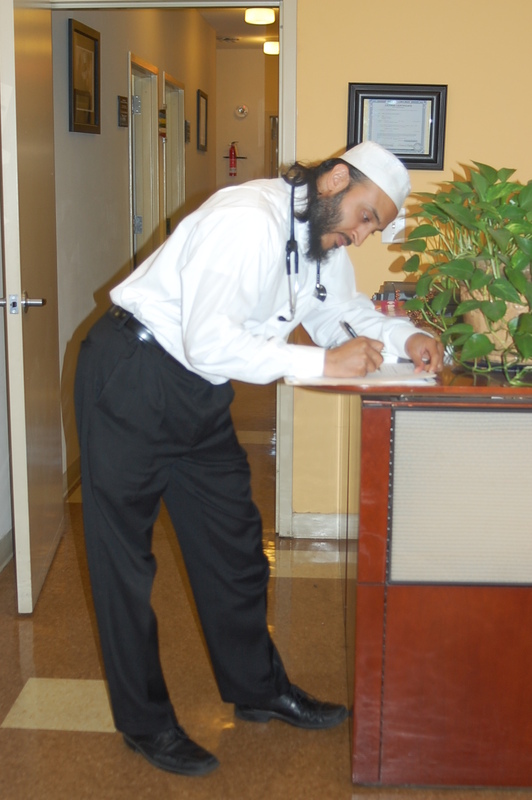 In November, Dr. Altaf Kaiseruddin, a family practitioner who has been working in the South Side of Chicago for many years, is celebrating his two-year anniversary as the Medical Director of the IMAN Health Clinic. With Dr. Kaiseruddin working as both Medical Director and staff physician along with our dedicated physician volunteers, such as Dr. Deeba Masood, Dr. Mohammed Haque, and Dr. Ahsan Arozullah, the Clinic has been able to extend its hours from two to five days/week. In addition to serving as a full-time community center providing a full complement of healthcare services, our Clinic is now an educational site for young aspiring volunteers and medical students who can gain valuable experience in healthcare under the guidance of physicians, nurses, and other healthcare professionals. In addition to expanded hours, the IMAN Clinic is able to offer new and much needed services to our community, including in-house ultrasound services, focused asthma visits, pain medicine management visits, acupuncture, patient medication assistance programs, support groups, and tuberculosis skin testing. In a very recent and exciting development, we have added a mental health clinic that started operation in the month of October. Francisco Lozornio, a licensed clinical social worker and an adjunct professor at Northeastern Illinois University, will be providing individual, group, and family counseling in our Clinic. Additionally, he will be working with adolescents in nearby schools. Students from the University of Chicago’s Social Work Department will be shadowing Lozornio as part of their clinical rotation at our site. Lozornio’s clinical social worker position and counseling services at the IMAN Health Clinic are a joint collaboration between IMAN and Southwest Organizing Project (SWOP), and are funded by LISC Chicago. Francisco J. Lozornio has recently joined IMAN’s Health Clinic as a Licensed Clinical Social Worker. He also holds an adjunct professorship at Northeastern Illinois University, Social Work Program. Previously, Lozornio was the Director of the Behavioral Health Service program at the Valley Community Clinic, a Federally Qualified Health Center, in the Los Angeles area in California. Most recently, Francisco worked at Marquette Elementary School in Chicago as a Behavioral Health Consultant. As a grassroots organization fighting for social justice in some of the most marginalized neighborhoods in Chicago, IMAN believes in the importance of not only providing services to those who need it and working to build community locally, but also in striving to fix the systemic issues that help to marginalize and subjugate low-income communities of color. One of the major mechanisms by which IMAN attempts to affect policy change is as a member organization of the United Congress of Community and Religious Organizations (UCCRO). UCCRO is a grassroots-led multiethnic human rights alliance mobilizing people, policy and ideals for the equitable advancement of marginalized communities, and IMAN is one of its founding organizations. The UCCRO Annual Convention for 2012 was held on Saturday, September 22 at Madero Middle School in the Little Village neighborhood. It featured the stories of UCCRO leaders, and engaged them in learning about and voting on the UCCRO policy platform. IMAN leaders turned out in full force to learn about UCCRO’s policy priorities for the Illinois legislature’s upcoming veto session, and to vote on the platform that member organizations would be pursuing with various levels of government. As a result of discussions and voting at the Convention, UCCRO will be focusing on six issues affecting various segments of our constituencies at the upcoming legislative session. These include advocating for: (1) an elected school board for the city of Chicago, (2) driver’s licenses for all Illinoisans (including un-documented residents), (3) fair and legal districting of prisoners, (4) renter protection for those living in foreclosed properties, (5) funding for youth employment opportunities, and (6) removing crucial education and employment barriers for youth by making expungement of youth records easier and more efficient. IMAN staff and leaders will be joining other UCCRO member organizations down in Springfield several times this session to advocate for these issues with policymakers and legislative staff. By maintaining long-term alliances that bridge cultural, racial, ethnic and religious divides, and that are deeply grounded in a sense of mutual trust for one another, IMAN hopes to further its commitment to a common vision and strategy for uplifting change.